To research and develop Future Style Industry structure and business design by high technology and advanced research. In this Division, we have already built up two entities with Industry, National research and universities. The first one is named at ‘Things and System’ consortium which is composed of Industry companies. The Second one is “Things and Systems Society’ which aimed at to research innovation mechanism for Production/process oriented to total system with products by Faculties, Researchers and students. Our goal is revitalize Japanese industry by ‘Things and Systems’. The consortium is formed by not only Japanese Industry companies but US. Chairperson of the consortium is Mr. T. Nagashima, former CEO of Teijin Corp and chaired the council of the Japanese Association of Corporate Executives of Things and System. Prof. Tanaka named as Vice Chairman. The Society is formed by Faculties, National Institute Researchers, Business School students, Industry researcher’s. The Chairperson is Mr. K. Motoyama, who is the CEO of Tokyo University of Science and have experienced several management position, such as CEO of Asahi Soft Drinks. These two entity and Things and System research division is collaborative discussion meeting every month. The scheme is as follows. From the viewpoint of Servicization, this group research about efficiency, computerization and value proposition regardless of production and service as a total system. From a management of technology of view, this group research process of the transformation from products oriented to integrate service. technical management, HR and organization for the management systems of transforming to service or the global expansion that integrated business administration. 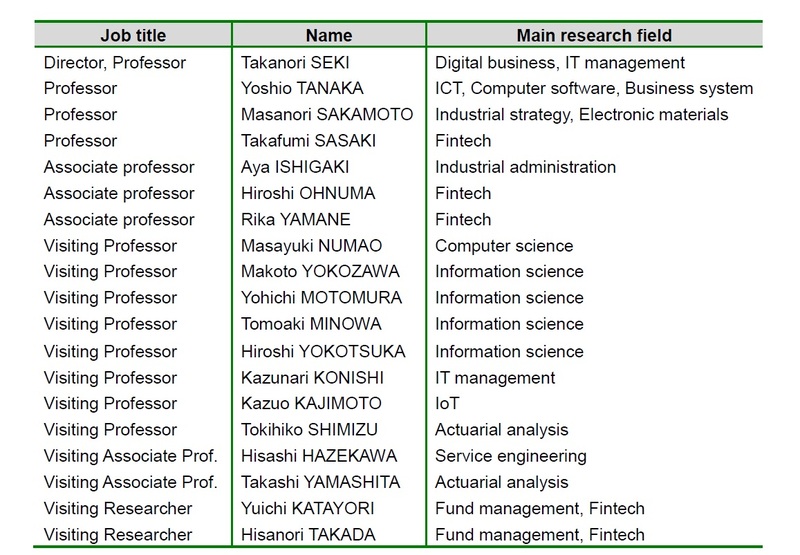 This team makes research, data analysis, security system, privacy system and system interoperability on BIG data, which I collect from the real world, based on computer science and data mining technology. This team research and study on practice case which THINGS industry has experienced to change or reform. Cases are mainly sort out from Things and System consortium member　companies and global companies. As a related organization of this research department, we cooperate with the “Things and Systems Association”. They are building the opportunity to discuss with experts (National Institute members, corporate managers, R&D engineers and planning department). This Division has operated a workshop of monthly in cooperation with them. In parallel researching with Industry. The this research division intended to find out research seeds and to make seed technology base on advanced Business design. There are many Japanese good companies who are providing good products and good components with high quality these thirty to forty years. However, We Japanese Industry is losing position these several years. We need to understand current situation. 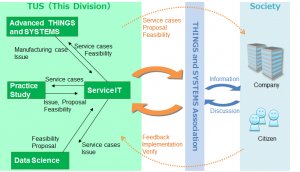 Consider current positioning, we defined our objective is to revitalize Japanese industry by ‘Things and Systems’ at IoT world ( Outcome Economy) with NEW Business Design.